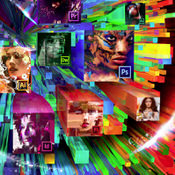 IMPORTANT NOTE: I have to say that this packaging install the COMPLETE ADOBE CC 2014 MASTER COLLECTION for mac., including ACROBAT and LIGHTROOM. For this cause, you will need more than 24 free Gb in your installation HD (for the decompression and installation of all the apps). P.S.2. You do NOT need to sign into creative cloud to use any of the software. The world’s best creative apps. Right on your desktop.